Situated in Murray Bridge, this motel is 1.4 mi (2.2 km) from Murray Bridge Golf Course and 1.4 mi (2.2 km) from Murray Bridge Racecourse. Unity College and Monarto Zoological Park are also within 9 mi (15 km). 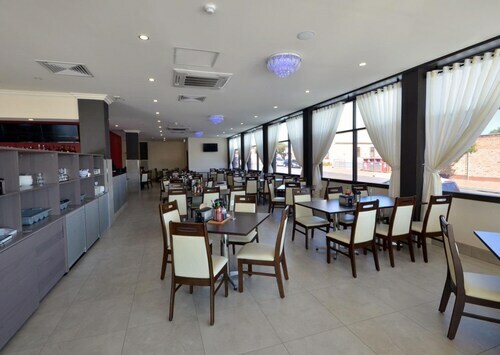 Situated in the business district, this hotel is within 3 mi (5 km) of Murray Bridge Golf Course, Murray Bridge Racecourse, and Unity College. Monarto Zoological Park is 8.8 mi (14.1 km) away. Situated in Murray Bridge, this motel is within 3 mi (5 km) of Murray Bridge Golf Course, Murray Bridge Racecourse, and Unity College. Monarto Zoological Park is 8.7 mi (14 km) away. Situated in Murray Bridge, this hotel is within 3 mi (5 km) of Murray Bridge Golf Course, Murray Bridge Racecourse, and Unity College. Monarto Zoological Park is 8.8 mi (14.1 km) away. Situated in Murray Bridge, this golf motel is within 1 mi (2 km) of Murray Bridge Golf Course and Murray Bridge Racecourse. Unity College is 2.4 mi (3.8 km) away. 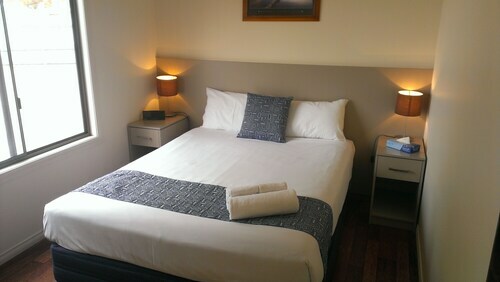 Hotels in Murray Bridge start at $55 per night. Prices and availability subject to change. Additional terms may apply. Spending several days in Murraylands? Through Travelocity's reservation page, you'll unearth a small number of options in Murray Bridge. 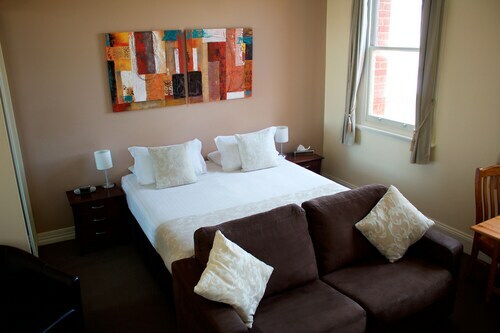 Murray Bridge offers 6 lodgings within a 6-mile (10-kilometer) radius of its central area. 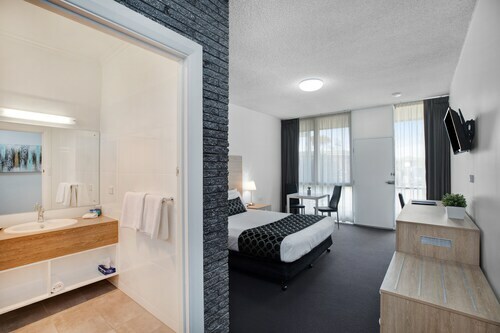 The Oval Motel, is an ever-popular option for the modern visitor thanks to the fact that it is the most centrally located accommodation choice in Murray Bridge. Check out the Riverview Rise Retreats as well as the Balcony On Sixth Lodge. The Riverview Rise Retreats is located 16 miles (26 kilometers) away from the heart of Murray Bridge. The Balcony On Sixth Lodge, is 1 mile (2 kilometers) away. Some other possible hotel options are the Mannum Motel and the Murray Bridge Caravan Park. Tailem Bend is 16 miles (25 kilometers) to the southeast of Murray Bridge and is home to Rogers Park and Tailem Bend Golf Club. Travelocity-listed Tailem Bend accommodation options include the Motel River Bend and Lyrabendi Farmstay. Alternatively, you could consider staying at Strathalbyn, 25 miles (39 kilometers) to the west of Murray Bridge, where you can pick from the Strath Motel and Victoria Hotel - Strathalbyn. Regardless of whether you're passing through or spending a few nights in Strathalbyn, be sure to venture to the St Andrew's Uniting Church and Soldiers Memorial Garden. If you are interested in sport and love watching local clashes you might choose to spend a day at Adelaide Oval, located 40 miles (65 kilometers) to the west of Murray Bridge. Enlightened travelers who are thinking about booking accommodation close to the action, make a reservation in the Adelaide Heritage Cottages & Apartments or Buxton Manor. Adelaide International Airport is a primary entry point for those accessing Murray Bridge. It is located 45 miles (70 kilometers) from downtown. If you would like to find a base nearby, try the Seawall Apartments or Stamford Grand Adelaide.